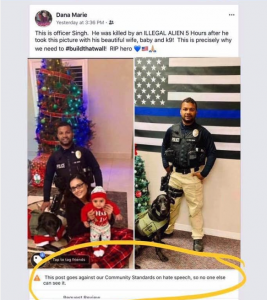 Menlo Park, CA – Blue Lives Matter has confirmed that Facebook is taking actions against Facebook accounts that call a cop-killer an illegal immigrant. Gustavo Perez Arriaga, 32, fatally shot Cpl. Singh during a predawn traffic stop on Wednesday, leading to a massive multiagency manhunt. He was captured Friday morning. Arriaga is an illegal immigrant, has self-promoted his status as a member of the Sureno street gang, and has two prior drunk driving convictions in Madera County, Sheriff Christianson said.